This beautiful appointed 5 bedroom, 3-bath property is incredibly clean and smartly decorated and we personally keep it that way for your comfort and ours because we use the house too. We want it to be like home and many of our guests have left comments to that fact. This unit is completely furnished, beach block condo and is available. The second and third floors offer 5 bedrooms and 3 full baths and sleeps 10-12. Please see bedroom descriptions below. What makes this unit stand out is the third or top floor which is an enormous upper cottage master king suite (5th BR), sleeper sofa and 42' TV. This king suite has it's own double vanity private bath, wet bar and two (2) private decks with great sunrises and sunsets. The main floor has a large family room area with ample seating, 46' flat screen TV, fireplace, dining area and comfortable front porch for quiet evenings. The fully equipped and well-stocked kitchen allows for multi-family dining. You will find upscale stainless steel appliances throughout and Corian counter tops. The unit is popular for many reasons, the most important being the homeyness. This well stocked home offers the following amenities: well stocked kitchen (spices, coffee, tea, flour, sugar, etc. ); enough bath towels for the entire family; laundry supplies; beach chairs; wagon to haul beach gear; coolers; beach toys; outdoor grill; outdoor secured shower high speed wireless internet and much more. The house also provides a complete supply of laundry supplies plus all the paper goods for bathroom and kitchen (toilet paper, paper towels, napkins, plastic bags, foil and saran wrap). Our family has been vacationing in Ocean City for almost 20 years and we love its family friendly atmosphere. 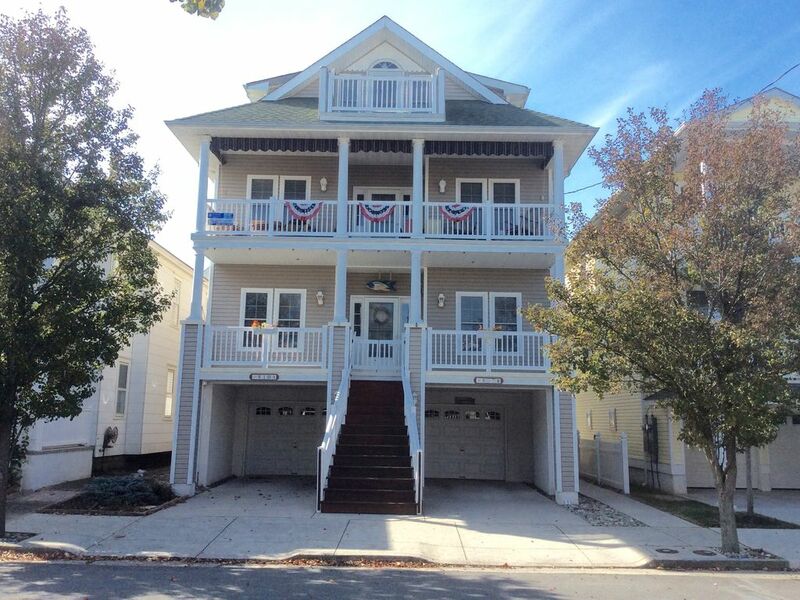 We have dreamed of owning our own home in Ocean City and now it is a reality! We were fortunate to find a property that was owned by another couple who not only loved Ocean City but loved sharing it with other families. Many of our renters have been coming back to the same property for many years.We have strived to provide a warm and welcoming home with many amenities that most vacation rentals do not provide. Our property is only 1 block from the beach and boardwalk. It is an easy walk to all the amusements, food and shopping that the Ocean City Boardwalk is known for. Who wants to worry about dragging beach gear and basic necessities on vacation. We provide beach chairs, umbrellas, and a beach cart as well as coolers of various sizes and beach tags for 10 adults. We also provide bath towels , laundry detergent, and all the paper goods (paper towels, toilet paper, napkins...) that you will need for your stay. We supply all the laundry supplies. You'll find 7 beach chairs, beach toys for the kids, 2 beach umbrellas and a cart to carry everything to the beach.We also provide coolers. Enough towels, wash cloths and hand towels for the entire family plus some extra beach towels. Fully stocked with all the cooking utensils needed for a large family, spices, tea, coffee, sugar, all paper and plastic for storage and trash plus cleaning supplies. Beach toys and a cart to carry everything to the beach. A limited number of board games are in the family room. Unit B - Listing #5900 - 5 Bedroom, 3 full baths: - Upper cottage king master suite - King master main floor - 1 queen bedroom - 2 bedrooms with 2 twin beds each - 2 queen sofa bed - 1 pack and play - Three (3) full baths - COMPLETE with towels and wash cloths for the entire family - 4 Decks - 6 deck chairs and accent tables front porch - 8 deck chairs, lounge chair and table roof top porch - 2 deck chairs and table rear porch - 2 deck chairs 3rd floor rear porch - Beach Tags - 10 Tags ($250.00 value) - Beach Chairs - 7 -2 Beach Umbrellas and beach toys - Coolers for the beach - 3 different sizes - WAGON to carry all that stuff to and from the beach - All the paper and plastic supplies - for bath & kitchen - Washer and dryer complete with laundry supplies - Fully stocked fully equipped kitchen with gas stove, microwave, dishwasher, disposal, refrigerator, ice-maker, toaster, blender, mixer, crock pot, coffee maker and Keurig, large electric grill for multi-family breakfast. Spices, coffee filters, condiments, cleaning supplies,etc. - Living room has a fireplace (seasonal) - Central air conditioning/heating and ceiling fans throughout - Three televisions, cable, VCR/DVD and 46' flat screen TV in the family room - Bar-B-Q for your outdoor cooking - Outside showers and backyard - You need it, we have it! horseshoes, wildlife viewing, and piers for fishing and crabbing. PLENTY of nightlife in Somers Point just minutes away!